Cut loaf of dough crosswise into 4 pieces to make buns. Place dough pieces seam sides down and 3 inches apart on cookie sheet. With hands, stretch each dough piece until 4 inches long. With sharp knife, cut 2 diagonal slashes, 1/2 inch deep, on top of each. Meanwhile, in 1-quart saucepan, heat chili over medium heat about 5 minutes, stirring occasionally, until hot. Heat hot dogs as directed on package. With serrated knife, cut buns in half horizontally, cutting to but not completely through one long side. Place 1 hot dog and about 1/3 cup chili in each bun. Want more flavor? 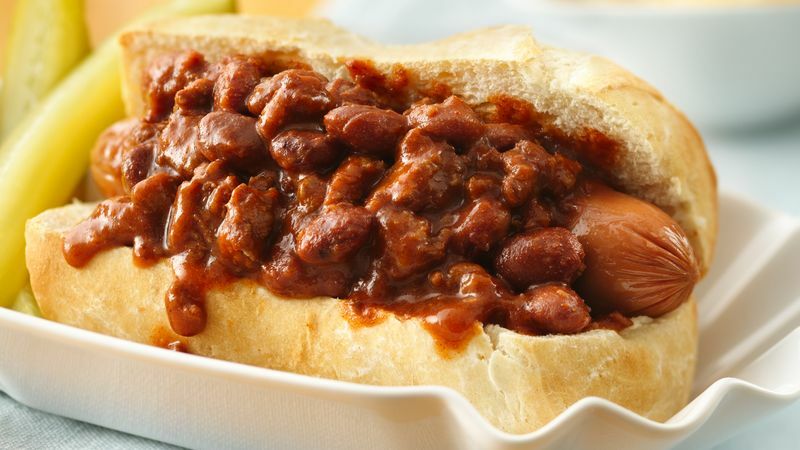 Sprinkle chili dogs with your favorite shredded cheese, such as Cheddar or pepper Jack.